The project consisted of the provision of a multi purpose dance studio, refurbishment of changing facilities, reception and fitness suite. This facility formed part of a large complex, providing facilities for both the public and private sector. 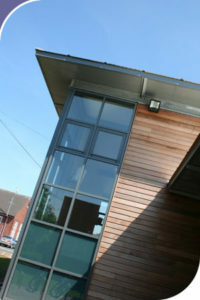 The structure is steel frame, finished externally in Cedar cladding and lime based render, part of the sustainable approach encouraged by Staffordshire County Council.